This expedition has been specifically timed to coincide with the most productive monsoon winds and lunar currents, which strongly influence the movements and feeding habits of reef manta rays. The aim of this trip is to use the knowledge of Manta Trust experts to find these feeding aggregations and allow the guests to experience the wonder of immersing yourself amongst a feeding frenzy of these gentle giants. 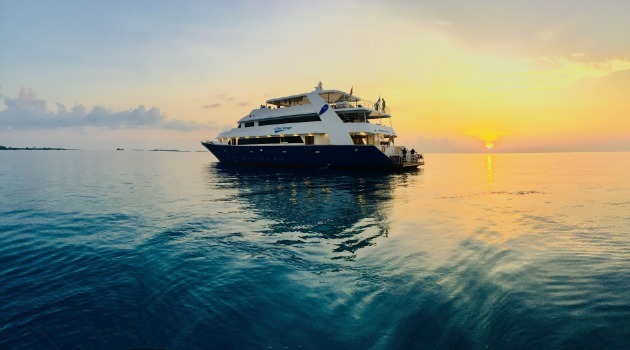 On this expedition we will explore the pristine and rarely visited northern atolls of Baa, Raa and Lhaviyani diving on untouched reefs and looking for poorly studied manta ray populations. A trip designed especially for adventurers looking for something new and rarely offered in the Maldives! Baa Atoll is off the main route for the majority of dive liveaboards and we will venture into this more northern atoll specifically to seek out the feeding mantas and hopefully a few whale sharks as well. To see several of the world's largest fish feeding amongst dozens of the world's largest rays is something most people will never forget. Just north of Baa we will venture into Raa Atoll, one of most unexplored atolls of the Maldives regularly visited by mantas and hosting some stunning dive sites. Vertical walls covered in soft corals, gardens of anemones and mantas gliding above our heads are only a few of the marvels of this region. Before descending back to Malé we will finally visit Lhaviyani Atoll, another spectacular northern atoll. Here sharks, schools of eagle rays, tunas and other large pelagic fishes will be the main characters of our dives with the possibility of encountering more manta rays and dive one of the most beautiful shipwrecks of the country. While the weather in the Maldives at this time of the year is likely to be more changeable, these monsoonal conditions are exactly what create the planktonic blooms upon which the mantas and whale sharks aggregate to feed. Furthermore, we can never guarantee these natural events, but we have put together a trip which maximizes our changes of being in the right place at the right time, guided by the expertise of The Manta Trust's CEO and founder Dr. Guy Stevens. For information regarding passports and visas, health or foreign office advice, please click here.